I’ve had one lonely sheet of frozen puff pastry sitting in my freezer since December. It didn’t smell too much of freezer burn, so I nabbed it for a simple plum tart. This is much less a recipe, and more of a guide to putting one of these things together. I’ll probably make this tart again when the local peaches are ready. They’re so easy to throw together it’s almost like cheating. 2. Cut the puff pastry in half, long ways or short ways both work. Then roll both pastries out until they're about the thickness of pie dough and place on a parchment covered baking sheet. 3. Brush the edges of the dough with a little water, and fold the edges over to create a boarder leaving the corners unfolded. Take the corners and stretch them in your fingers slightly and twist around a half turn. 4. Arrange the plums however you like on the pastry inside the boarder. Don’t put them on top of each other in a pile though or your crust will be soggy. Less is better here. 5. Warm the honey in the microwave until its very fluid. Stir in the Disaronno and brush some over the plums and sides of the pastry. Save a little of the honey mixture for a final brushing. 6. Bake for 20 to 25 minutes or until golden brown. For a shiny look, warm the leftover honey mixture and lightly brush the fruit and crust after removing from the oven. Tarts can be served warm or cold. that looks sooo good, perhaps a great way to use up my plums from my csa box this week!! thank you! Thank-you both. I hope you like this one, it's so simple please feel you can dress it up anyway you prefer. I've actually completely overhauled my life in the past week! hahah it's very exciting! I got my dream job in my dream city! So now I'm taking 2.5 months off (lucky me!) to do some traveling and relaxing before going back to the hard-driving corporate world. I'm actually just taking a break from trip-planning to Japan, it's a bit overwhelming since not even the maps are in English! Ahhhhhhhh! Oh how gorgeous! I do love summer fruits. And I like that you used honey instead of sugar! It's gorgeous, Laura :D One item cleared out...umpteen (?!) to go! LOL. This is a beautiful dish. Thanks for sharing. I hope you will join me for Crock Pot Wednesdays this week. That dessert looks so gorgeous. I have a bunch of plums just waiting to be used in such a recipe. Glad you liked the earrings. Got your note in the mail today. Questa torta è semplicente deliziosa, complimenti. Ciao Daniela. something so simple can be so pretty and stunning to photograph. came out wonderful! I can't believe the crust came so beautiful after having been in the freezer that long. I've gotta get me some of that! Nothing rarely beats plums and puff pastry! Delicious! Oh what can be better than this!! It looks beautiful, Id love it topped with some ice cream. I'm always on the look out for simple, good, fruit desserts. Now that plum season is coming up in Norway, this would be great! Thanks for sharing! Easy and delicious and a bit different with plums. This recipe is a keeper for a party I have coming up next month. Thanks for sharing. I always keep puff pastry in the freezer in case I get the urge to make something like this. It's gorgeous. This looks absolutely fabulous. I have some puff pastry and some plums...I know what we're having tonight! This is so gorgeous. And simple is better! 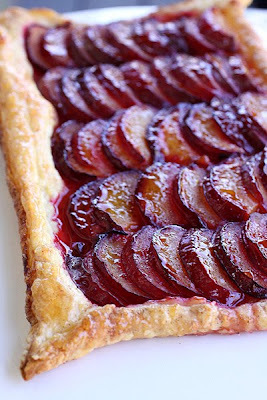 Your plums look beautiful lined up on puff pastry and that glaze sounds so wonderful. I must try this! Lovely! Hi Laura... been away for a while and am just now catching up with all your latest posts. This tart is to die for! I have some Pluot sitting around, waiting for me to do something with them. Your recipe has inspired me! Keep up the amazingly good work!!! I only had spiced rum on hand, so used that instead - it worked great! Thank you! !